31 March 2004 - Centenariazo! On 31 March 2004, visitors Venezuela upset Uruguay 0-3 in a World Cup qualification match. Going into their qualification campaign, Uruguay manager Juan Ramon Carrasco had reworked the side's rigid defensive style into an open and attacking flow, resulting in wins over Bolivia (5-0) and Chile (2-1), as well as an explosive 3-3 draw with Brazil (though they also suffered a crushing 4-1 loss at Paraguay). Venezuela, meanwhile, had opened with losses to Ecuador (2-0) and Argentina (0-3) before rallying with narrow wins over Colombia (0-1) and Bolivia (2-1). Playing before a crowd of 40,094 at the Estadio Centenario in Montevideo, the hosts attacked from the opening whistle, applying furious pressure on the Venezuelan goal. But it was the visitors who took the lead in the 19th minute with a long-range blast from midfielder Gabriel Urdaneta. Uruguay renewed their energy on offense and were twice denied by the woodwork in the first half. Venezuela doubled their lead in the 67th minute with a goal from Héctor "El Turbo" Gonzalez on a counter. Ten minutes later, Gonzalez delivered a cutting pass that fellow midfielder Juan Arango easily stabbed home for the final 0-3 margin. 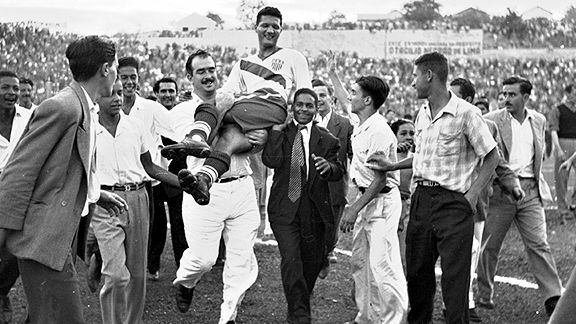 Venezuelan supporters dubbed the match "the Centenariazo," after Uruguay's famous "Marazanazo" victory over Brazil in 1950. Uruguay manager Carrasco, meanwhile, called the match "a stain on the history of Uruguayan football." Ultimately, neither team qualified for the 2006 World Cup, as Venezuela's form faded and they finished 9th out the 10 CONMEBOL teams. Uruguay finished 5th and advanced to the CONMEBOL/OFC playoff where they lost to Australia on penalties. 30 March 1904 - What If They Held A Final, But Nobody Came? On 30 March 1904, Club Español de Madrid were the only ones to show up for the Copa del Rey final. And they still didn't win the cup. The 1904 non-final was the culmination of a controversial tournament for the club. After two years of being run by Madrid CF, the 1904 edition was organized by the Madrid Football Federation, whose president was also the president of Español de Madrid. Four teams participated in the initial rounds, with the winner scheduled to play in the Final against the previous year's champions, Athletic Bilbao (pictured in 1904). Español de Madrid drew their first match with Madrid-Moderno, 5-5, on 13 March. The two sides decided to schedule a replay rather than go to extra time, but could not agree on the timing. Español wanted to have it the following day, while Madrid-Moderno wanted to have at least a 48-hour break between matches. When Madrid-Moderno failed to show up on 14 March, the Madrid Football Federation declared Español the winners. They advanced to the semi-final match against Moncloa FC on 27 March, but an injury to an Español player forced the teams to abandon the game. Again, the teams were unable to agree on a replay date and, again, the Madrid Football Federation declared Español to be the winners. The federation set 30 March as the date for the Final, moved from the originally-scheduled date of 26 March. 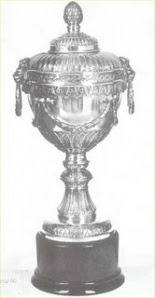 Español de Madrid finished as runners-up in 1909 and 1910, while Bilbao went on to win the tournament a total of 23 times, second only to Barcelona's 25. 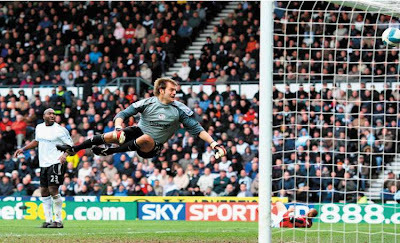 On 29 March 2008, a 2-2 draw with Fulham guaranteed Derby County's relegation--the earliest such guarantee in the history of the Premier League. Derby had earned promotion to the Premier League the year before under new manager Billy Davies, who had joined the club in June 2006. But they struggled in the top flight, winning only one match all season (a 1-0 victory over Newcastle on 17 September). They dropped into last place in the fourth week, then rose to 19th before getting pinned to the bottom again in the eleventh week and staying there for the remainder of the season. Billy Davies left the club in November, replaced by Paul Jewell. They entered the match against Fulham with only 10 points, 17 points shy of safety. With only seven games left, Derby needed a win to preserve any hope of survival. And Fulham were ideal opponents, as they were in the relegation zone themselves, only one spot above Derby. Derby struck first with a 10th-minute goal from Emanuel Villa, but the visiting Cottagers claimed the lead after a header from Diomansy Kamara (24') and an own-goal from Derby's Dean Leacock (78'). Villa salvaged a point for Derby with a late goal in the 80th minute, but it was too little to save their season. They were 19 points from safety with only six matches remaining, thus ensuring their drop from the top flight. It is the earliest in the season that any team has been mathematically relegated, breaking the previous record set by Sunderland on 12 April 2003. And it was Derby's last point of the season. They lost all of their remaining games to finish with 11 points, the lowest points total since Stoke City finished with 17 in 1985 and a record low since the league went to three points for a win. 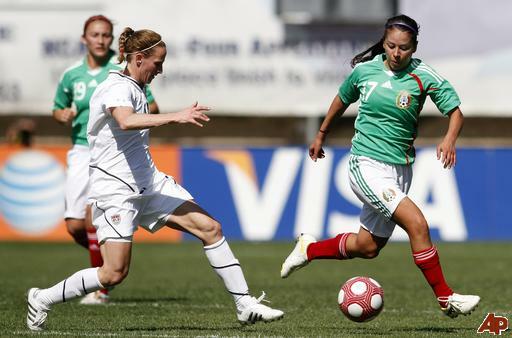 On 28 March 2010, midfielder Kristine Lilly came on as a first-half substitute for the US in a friendly against Mexico. By doing so, she became the first person in international football history to represent her country in four different decades. Lilly made her first appearance for the United States in 1987 when she was just 16 years old. Over the course of her 24-year international career, she has earned 352 caps while winning two World Cups (1991, 1999) and two Olympic gold medals (1996, 2004). She was on the bench for the match against Mexico, played at the University of San Diego's Torero Stadium, but entered in the 32nd minute as a replacement for midfielder Yael Averbuch. The US were already up 1-0 at the point with a 12th-minute goal from forward Amy Rodriguez and proceeded to extend their lead with strikes from Shannon Boxx (43') and Lauren Cheney (72'). Lilly's appearance meant that she played for the US in the '80s, '90s, '00s, and '10s. Her last appearance was as a substitute against Mexico on 5 November 2010. On 27 March 1989, Bradford City held Hull City to a 1-1 draw, starting a club-record streak of 27 winless league matches for the visiting Tigers. 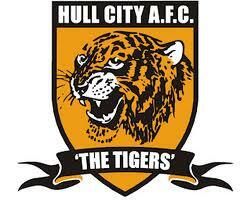 In fairness, Hull hadn't fared too well before the streak, either. By the time they visited Bradford's Valley Parade ground in March, they had won only 11 of their 35 matches in Division Two that season and were sitting in 19th place. They had beaten Plymouth Argyle the week before, but that rare victory stemmed a string of six straight losses. The draw with Bradford City dropped them into 20th place and they barely escaped relegation, finishing the season in 21st after 5 draws and 5 losses in their last 10 matches. The next season, they picked up where they had left off, going without a league win in their first 16 matches. They finally broke the streak on 11 November 1989, when they returned to Bradford City and managed a 2-3 victory. Labels: Bradford City AFC, Hull City F.C., Plymouth Argyle F.C. 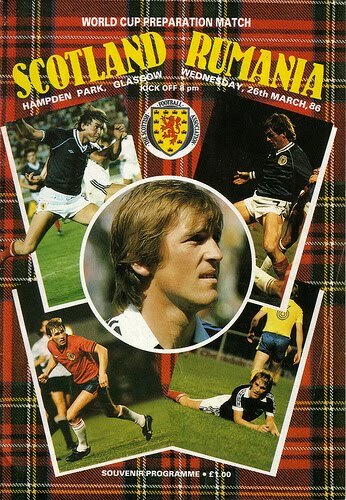 On 26 March 1986, Liverpool striker Kenny Dalglish won his 100th cap for Scotland in a 3-0 win over Romania. To date, he is the only player to reach that milestone for the Scottish national team. He received his first call-up in November 1971, coming on as a substitute in a Euro '72 qualifying victory over Belgium. Although it took him over a year to get his first goal, he eventually scored 30 times for Scotland to match the record set by Denis Law. Against Romania, manager Alex Ferguson gave the armband Dalglish, his seventh and last time to captain the national team. Scotland's starting XI included nine future managers, including two--Dalglish and midfielder Graeme Souness--who went on to take charge of Liverpool. Dalglish also managed Celtic during his career, as did another teammate of his that day, midfielder Gordon Strachan. Strachan opened the day's scoring in the 18th minute and was followed shortly by defender Richard Gough (27'). Gough's partner in defense, Roy Aitken, added the third in the 81st minute, his only goal in 57 appearances for Scotland. Dalglish, meanwhile, went on to earn two more Scottish caps before retiring from the national team later that year. On 25 March 2006, Reading FC secured promotion to the Premier League with a 1-1 draw at Leicester City. And they did it in record time. As recently as 2002, they were in Division Two, but they won promotion to Division One that year, then reached the Championship in 2004. In their second season there, they got off to a poor start, losing to Plymouth 1-2 on opening day. But they followed that loss by going unbeaten for their next 33 league matches--they lost only twice all season. Along the way, they took the table's top spot in November and held on to it for the duration. 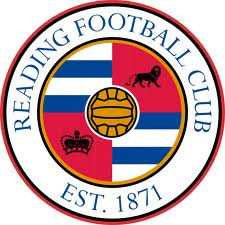 Going into their match against Leicester City, Reading were 16 points clear of second-place Sheffield United, with seven matches left to play for both teams. Critically, they were also nineteen and twenty points clear, respectively, of Walsall and Leeds United, who were the other teams in contention for the top two automatic promotion spots. Approximately 3,000 Reading supporters made the trip to Walkers Stadium--part of an overall crowd of 25,578--only to see the visitors go down 1-0 in the 38th minute due to a goal from Leicester's Iain Hume. But they equalized with a header from Kevin Doyle in the 85th minute and escaped with a draw. As it turned out, the results from the day's other matches meant they would have secured a top-two finish even with a loss. It was their first promotion to the top flight and it was the earliest any team had guaranteed promotion since the league went to a 46-game season. Unfortunately for Reading, they stayed in the Premier League for only two seasons before dropping back down to the Championship in 2008. Labels: Iain Hume, Kevin Doyle, Leicester City FC, Reading F.C. On 24 March 1949, Helmut and Erwin Kremers were born in Mönchengladbach. 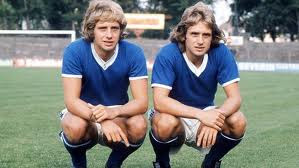 They went on to become German internationals and the first twins to play in the Bundesliga. Both of them started their careers as youth players with their hometown team, Borussia Mönchengladbach, then joined the club as professionals in 1967. They continued as teammates at other clubs. moving to Kickers Offenbach in 1969, then to Schalke in 1971. Erwin, a striker, retired in 1979, but Helmut, a full back, played for three more years, remaining with Schalke until 1980 then spending time with Rot-Weiss Essen (1980-81), the Calgary Boomers (1981) and the Memphis Americans (1981-82). Virtually inseparable at the club level, the brothers played together only twice on the international stage. Erwin made 15 appearances for West Germany between 1972 and 1974, winning the 1972 European Championship. Helmut received a later a call-up and got fewer caps--8 between 1973 and 1975--but was part of West Germany's World Cup-winning side in 1974. Despite their footballing accomplishments, they are widely remembered for their 1974 record release, "Das Mädchen Meiner Träume," which translates to "The Girl of My Dreams." The B-side was apparently titled "Mo-Di-Mi-Do," which I assume needs no translation. 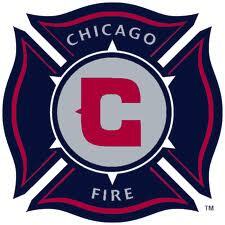 On 21 March 1998, the Chicago Fire got off to good start, beating fellow MLS expansion team Miami Fusion 2-0 in their first league match. Chicago and Miami joined MLS that year as the league's eleventh and twelfth teams and met in Fort Lauderdale on the season's opening day. Playing before a crowd of 14,653 at Lockhart Stadium, the two were inseparable in the first half, going into the break scoreless despite playing open and attacking football. They combined for a total of 30 shots on the day (14 for Chicago and 16 for Miami), though they got only five each on goal. Fortunately for Chicago, two of theirs went in, as Roman Kosecki (76') and Ritchie Kotschau (87') found the back of the net to give the Fire a 2-0 victory. It was the start to a fantastic season for Chicago, who went on to finish second in the league's Western Conference, then won the MLS Cup with a 2-0 win over DC United in October. On 20 March 1991, defending champions Milan forfeited their European Cup quarterfinal against Marseille when they refused to play the last two minutes. After drawing the first leg in Milan 1-1 two weeks earlier, they met at Marseille's Stade Vélodrome for the second leg. It was a contentious match, with referee Bo Karlsson issuing five yellow cards, three to Milan and two to Marseille. It remained scoreless deep into the second half, when Marseille finally took the lead with a 75th-minute goal from winger Chris Waddle. With two minutes of stoppage time remaining and the score still 1-0, half of the stadium's floodlights went out, forcing Karlsson to halt the match. He intended it to be a temporary halt, but when the lights came back on fifteen minutes later, Milan director Adriano Galliani refused to put his team back on the pitch, claiming that television crews had "disrupted the match" by going out onto the field, though some critics accused him of angling for a replay. In any event, UEFA declared it a forfeit, awarding the victory to Marseille. Afterward, UEFA banned Milan from European competition for one year and also suspended Galliani from all official functions until July 1993. Marseille made their way to the final, where they lost on penalties to Red Star Belgrade. On 19 March 1924, Joe Gaetjens, who scored one of the most memorable goals in the history of the United States national team, was born in Port-au-Prince, Haiti. Born to a prominent family--one great-grandfather was sent to Haiti on a mission by the king of Prussia and another was a general involved in Haiti's fight for independence--Gaetjens started his career with L'Etoile Hatienne, where he won championships in 1942 and 1944. But in 1947, the then-23-year old forward moved to New York to study accounting at Columbia University. While there, he continued to play football for American Soccer League club Brookhattan, owned by Eugene Diaz, and supplemented his pay by washing dishes at Diaz's Harlem cafe. Gaetjens was the ASL's top scorer in 1950, which led to his inclusion on the US roster for the 1950 World Cup in Brazil. (He was eligible under the rules at the time, which required only that players had signed a paper expressing their intent to apply for citizenship, which Gaetjens had done.) There, after an opening 3-1 loss to Spain, Gaetjens scored with a diving header to beat England 1-0, one of the greatest upsets in World Cup history. Afterward, he played briefly in France, including a short spell with Racing Club de Paris, then returned to Haiti and made a solitary appearance for the Haitian national team in 1953. He started a dry cleaning business and coached youth football until 1964, when, due to political activities of his younger brothers, he was imprisoned upon the orders of Haitian president François "Papa Doc" Duvalier. He was never seen in public again and his death remains a subject of speculation. On 18 March 2010, Fulham rallied from a 4-1 aggregate deficit to beat Juventus in the Europa Cup, 5-4. It was only Fulham's second appearance in a UEFA competition, but they beat several more experienced sides on the way to their meeting with Juventus, including group-stage wins over Basel (twice) and CSKA Sofia, plus a knockout round aggregate victory over Shakhtar Donetsk. They lost their first leg against Juventus in Turin on 11 March, 3-1, presenting an uphill battle for the second leg at Craven Cottage. That hill became a little steeper in just the second minute, as Juventus striker David Trezeguet scored to extend their aggregate lead to 4-1. Fulham got a lifeline seven minutes later with a goal from striker Bobby Zamora, then caught a break when Juventus defender Fabio Cannavaro received a straight red card for a cynical foul on Zoltán Gera in the 27th minute. Gera made Juventus pay in the 39th minute, scoring from two yards out to narrow the aggregate margin to 4-3. Shortly after the break, Gera brought Fulham level when the referee awarded a 49th-minute penalty for a Juventus handball. Then, in the 83rd minute, with extra-time looming, Fulham substitute Clint Dempsey unleashed an arcing shot from outside the penalty area that flew into the top far corner of the net. It was a remarkable goal and sealed the victory. Fulham eventually reached the tournament final where they fell to Atlético Madrid. On 17 March 1996, Genoa won the last Anglo-Italian Cup, beating Port Vale 5-2. And the match wasn't as close as the score makes it seem. Established in 1970, the tournament came and went in different phases until the 1996 edition, which was the competition's eighth and last year, with eight English teams and eight Italian teams participating. They were evenly divided into two groups, then played each team in their group from the other country (Genoa and Port Vale played to a scoreless draw in their group). In each group, the top two teams from each country then advanced to the knockout rounds, where the English played against the English and the Italians played against the Italians until one team from each country reached the final. Playing at Wembley, Genoa cruised to a 3-0 lead with goals from Gennaro Ruotolo (12'), Fabio Galante (21'), and Vincenzo Montella (39'). After the break, Ruotolo struck twice more (54', 66') to extended the lead to 5-0. Port Vale got a late brace from Martin Foyle (68', 82') to close the gap to three, but that proved to be the final margin. Genoa's win evened the overall tournament results to four for each country, as English teams won in 1970 (Swindon Town), 1971 (Blackpool), 1973 (Newcastle), and 1995 (Notts County), and Italian teams won in 1972 (Roma), 1993 (Cremonese), and 1994 (Brescia). 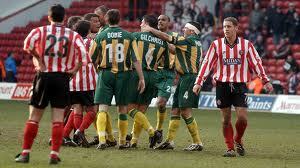 On 16 March 2002, a match between Sheffield United and West Brom was abandoned after 82 minutes and three red cards. The ejections started early, as United goalkeeper Simon Tracey received a 9th-minute red card for handling the ball outside the box, forcing United to make an early substitution to bring on their back-up keeper. West Brom capitalized on the man advantage, with forward Scott Dobie scoring in the 18th minute. Captain Derek McInnes doubled the lead in the 63rd minute, then sparks started to fly. 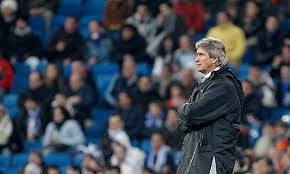 United manager Neil Warnock made a double substitution in the 64th minute, bringing on midfielder Georges Santos and forward Patrick Suffo, but neither remained on the pitch for long. Santos received his red card in the 65th minute for a violent two-footed tackle on West Brom's Andy Johnson. One minute later, Suffo received his marching orders for headbutting McInnes. After another goal from Dobie (77'), United lost two more players to injury. Having already made all three substitutions and lost three players, they were down to six men, leading referee Eddie Wolstenholme to abandon the match in the 83rd minute. West Brom manager Gary Megsom refused to participate in a replay, but it turned out to be unnecessary, as the FA allowed the 0-3 result to stand. On 15 March 2009, Marseille ended PSG's seven-game unbeaten streak and cost them the top spot. And that wasn't the worst of it. PSG had won six of their previous seven matches to climb from sixth to second in the table. A victory over Marseille would have sent them into first over Lyon. But despite having won 2-4 at Marseille back in October, the rematch proved to be more difficult. Playing before a crowd of almost 45,000 at the Parc des Princes, the visitors had a couple of close chances in the first five minutes and finally went ahead in the 24th minute with a goal from their Dutch midfielder Bolo Zenden (pictured). PSG's Ludovic Giuly equalized two minutes before the break, but the second half belonged to Marseille. Shortly after the restart, PSG went down to ten men after Zoumana Camara was ejected for a challenge on Zenden, then Marseille extended their lead with goals from Bakari Kone (55') and Lorik Cana (61') to claim the 1-3 win. The real excitement came after the match, however, as clashes between the two supporters groups resulted in 22 arrests. It was the latest in a series of incidents in the rivalry dating back to April 1995, when 146 were arrested after a Coupe de France semifinal. The loss dropped PSG back into sixth and sent Marseille up to second, which is where the teams finished the season. Labels: Boudewijn Zenden, Olympique de Marseille, Paris Saint-Germain F.C. On 14 March 1979, striker Nicolas Anelka was born in Le Chesnay, France. He went on to become the world's most expensive footballer, raising almost £85M in transfer fees over the course of his career. That career started with Paris Saint-Germain in 1996, but he made only 12 appearances for them before moving to Arsenal for a fee of £500,000 in 1997. In London, he was part of the Double-winning side of 1997-98, then contributed 18 goals in the 1998-99 season and won the PFA Young Player of the Year award. But he grew discontent with his role and his salary, earning the nickname "Le Sulk," and moved to Real Madrid that summer for £22.3M. Additional moves followed in short order, with Anelka rarely staying long in one place. After winning the Champions League with Real Madrid in 2000, he returned to PSG later that year (transfer fee: £20M), then spent time with Manchester City (£12M), Fenerbahçe (£7M), Bolton (£8M), and Chelsea (£15M). His transfer fees to that point totaled £84.8M, which was a record until Cristiano Ronaldo's £80M move from Manchester United to Real Madrid in 2009 put his total over £92M. 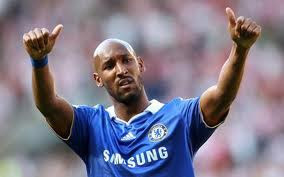 Anelka won another Premier League title with Chelsea, along with two more FA Cups. He also won the league's Golden Boot after scoring 19 league goals for them in the 2008-09 season. But he fell out of favor in the ensuing seasons and moved to Shanghai Shenhua on a free transfer in January 2012. He then spent time with Juventus and West Brom before joining Mumbai City, his current club, in 2014. 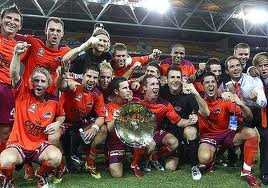 On 13 March 2011, the Brisbane Roar recovered from a two-goal deficit to claim the A-League title on penalties over the Central Coast Mariners. The win capped a remarkable season for Brisbane, who had gone undefeated since September 12, finishing the regular season with a record of 18 wins, eleven draws, and only one loss. In their two matches against Central Coast, they scored eight goals, winning 1-5 and drawing 3-3. When the teams met in the Grand Final, neither side managed to find the net for the first 90 minutes. That changed in the first period of extra time, as Mariners went up 2-0 with goals from forward Adam Kwasnik (96') and midfielder Oliver Bozanic (103'). But the Roar pulled one back in the second period, with substitute striker Henrique beating Mariners goalkeeper Matthew Ryan in the 117th minute. Then, in the final minute, midfielder Erik Paartalu scored the equalizer. In the ensuing penalty shootout, Brisbane keeper Michael Theoklitos saved two of Central Coast's first four shots to keep his team up 3-2. Henrique then stepped up to take Brisbane's fourth kick and beat Ryan once more for the win, claiming their first league title. Brisbane's unbeaten streak continued until November 2011, lasting a league record 36 matches. 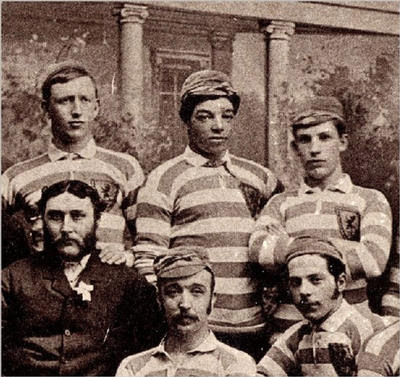 On 12 March 1881, Queen's Park fullback Andrew Watson became the world's first black international footballer when he received his first cap for Scotland. Born in British Guiana as the son of a Scottish sugar planter, Watson (pictured, center) enrolled at the University of Glasgow where his studies included math and engineering. While there, he developed a love of football. He first played for Maxwell FC, then Parkgrove FC and, eventually, Queen's Park (he also served as a club administrator for the latter two). While at Queen's Park, he earned high accolades, with the 1880-81 Scottish Football Association Annual calling him "one of the very best backs we have; since joining Queen's Park has made rapid strides to the front as a player; has great speed and tackles splendidly; powerful and sure kick; well worthy of a place in any representative team." He got his first call-up to the national team for a friendly against England, captaining Scotland in their 6-1 win. He earned two other caps in his career; both were victories as well. 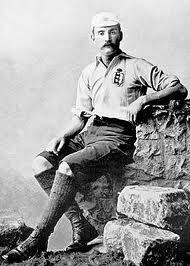 After retiring in 1887 after spells with Swifts, Corinthians, and a second stint at Queen's Park, Watson moved to Australia, remaining there until his death in 1902. 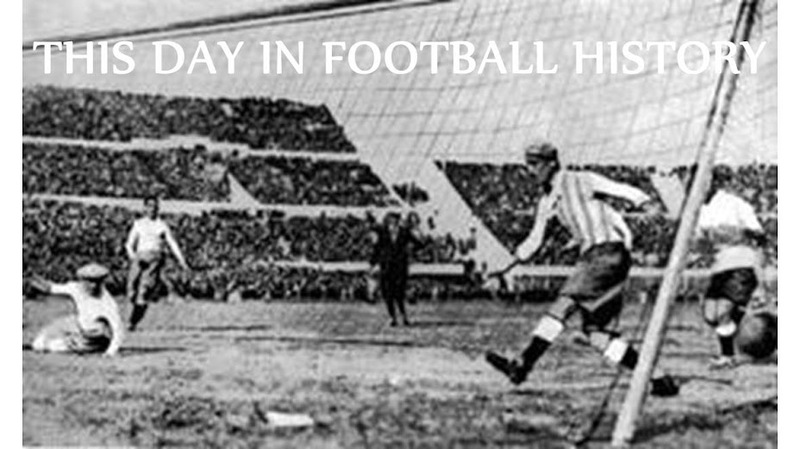 On 11 March 1900, Juventus played their first competitive match, losing 0-1 to Torinese. It was one of only four matches for them that season. 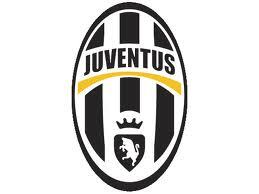 Founded in November 1897, at approximately the same time the first Italian league contests began, Juventus were not admitted to the league until three years later. At the time, the league, known as the Italian Football Championship, was divided into regional groups, with the group winners advancing to a series of playoffs. 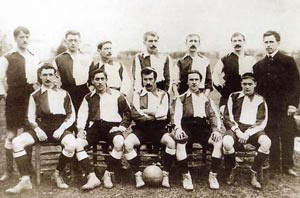 Only six teams participated in the 1900 edition, with Juventus joined in the Piedmont group with FBC Torinese and Ginnastica Torino (both unrelated to the current Torino FC). The other groups were Liguria, which included Genoa and Sampierdarenese, and Lombardy, which had only one team, Milan. Torinese had already beaten Ginnastica Torino before meeting Juventus at the Piazza d'Armi. Still wearing their original pink and black kits, Juventus fell by a single goal. They went on to beat Ginnastica twice, both times by the score of 2-0, before losing again to Torinese 2-1. They eventually won the first of thirty-one titles in 1905 after changing to their current black-and-white striped shirts, while Torinese were disbanded in 1906. On 10 March 1905, Chelsea FC were founded at the Rising Sun pub in Fulham. They've since become one of England's most successful clubs. The club's story starts with Gus Mears. In 1904, he purchased the Stamford Bridge ground in Fulham which was, to that point, the home of the London Athletics Club. Mears planned to redevelop the ground into a state-of-the art football facility, with the intent of hosting the area's existing local team, Fulham FC. But Fulham were not interested, so Mears decided to start his own club instead. Meeting at the pub across from the grounds entrance, he chose the name Chelsea after the neighboring borough. The new club joined the Football League's Second Division that first year, then went on to win their first promotion two years later. They took their first major honor in 1955, winning the league. They added several other trophies through the latter part of the 20th century, including three FA Cups (1970, 1997, 2000), two League Cups (1965, 1998) and two Cup Winners' Cups (1971, 1998). But their most successful period to date started with 2003-04 season after their acquisition by Russian billionaire Roman Abramovich. Since then, they have finished as league champions four times (2005, 2006, 2010, 2015). They've also won four more FA Cups (2007, 2009, 2010, 2012), three more League Cups (2005, 2007, 2015), and won the Champions League (2012). 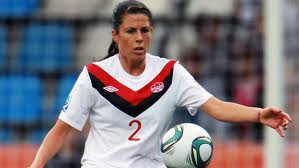 On 9 March 2011, a 99th-minute goal from defender Emily Zurrer gave Canada their third Cyprus Cup in four years, beating the Netherlands 2-1 (aet). Established in 2008, the Cyprus Cup is a women's invitational competition in Cyprus featuring national teams from around the world. Canada won the first edition, then finished as runners-up to England in 2009 before winning it again in 2010. Twelve teams participated in 2011, split into three groups of four. At the end of the group stage, the teams were paired up in various combinations in the placement round, with the winners of Groups A and B playing for the title. That year, Canada and the Netherlands were those two teams, with each winning all of their group matches. In the final, the Canadians took a 20th-minute lead with a goal from Jonelle Filigno. But Dutch striker Claudia van den Heiligenberg drew the Netherlands level twenty minutes later. The teams went to extra time, where Zurrer won the match with only the second goal of her international career (she had scored the first one, also a match-winner, just one week earlier in Canada's opening group stage victory over Scotland). The win also tipped Canada's all-time winning percentage over .500, giving them a record of 110 wins, 109 losses, and 34 draws. Canada returned to the final again in 2012, but lost to France, 0-2. 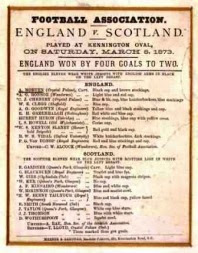 On 8 March 1873, England and Scotland met for just the second time, with both teams getting their first goals. Unfortunately for Scotland, England got more of them. Playing before a crowd of 3,000 people, England adopted a slightly more defensive formation for the match, abandoning their previous 1-2-7 for the 2-2-6 used by Scotland. Even so, they scored the opening goal, with William Kenyon-Slaney netting in the first minute. Alexander Bonsor doubled the lead nine minutes later, but Scotland drew level with goals from Henry Renny-Tailyour (12') and William Gibb (20'). The Scots tired in the game's latter stages, however, and conceded another goal to Kenyon-Slaney (60'), followed by one more to Charley Chenery (75') to end the day as a 4-2 win for England. The subsequent match report said "If any proof were necessary to evince the growing popularity of the winter game of wielders of the willow, there was sufficient evidence on this occasion to convince the most sceptical that football, if only aided by fine weather, is a game that could take its place among the leading pastimes of the day." On 7 March 1954, in their first-ever meeting, South Korea crushed Japan 1-5 in a World Cup qualifier in Tokyo. It was a match that carried a lot of political tension. Though they were the only two members in their qualification group (after China withdrew), Korean president Syngman Rhee initially refused to sanction any game against Japan due to their actions against Korea in World War II. He eventually relented, but only in part. 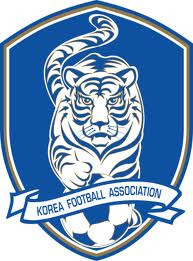 Instead of home and away matches as required by FIFA, he demanded that both matches be played in Japan so that no "past invader" would set foot on Korean soil. He also told the Korean players "Be prepared to throw yourselves in the ocean if you lose." Thankfully for them, that was not required, though they may have been worried when Japan took a 16th-minute lead with a goal from Ken Naganuma. But Chung Nam-Sick equalized six minutes later and Korea never looked back, getting additional goals from Choi Kwang-Suk (34'), Sung Nak-Woon (65'), and Choi Jung-Min (82', 85'). They played again in Tokyo one week later. That match ended as a 2-2 draw, which was enough to send Korea to their first World Cup in Switzerland. On 6 March 1962, Accrington Stanley, suffering from crippling debts, resigned from the Football League with thirteen matches left on their schedule. Founded in 1891 as Stanley Villa (after the Stanley Arms in Accrington), they took the name Accrington Stanley after the collapse of Accrington FC, one of the founding Football League clubs. After playing their first several seasons in the non-League Lancashire Combination, they were eventually elected to the League's Division Three (North) in 1921. They challenged for promotion on several occasions, including two second-place finishes in 1955 and 1958. When they finally switched divisions, it was in the other direction. Placed in Division Three upon the league's re-organization in 1958, they were relegated to Division Four the following season. That's where they were in February 1962 when club chairman Edwin Slinger disclosed that Stanley were deeply in debt to the tune of £8,000. A subsequent creditors' meeting revealed that the situation was actually much worse, as they owed an additional £40,000. Seeing no way clear of the financial crisis, Stanley played their last League match on 2 March--a 4-0 loss to Crewe Alexandra--then submitted their letter of resignation to the League office four days later. 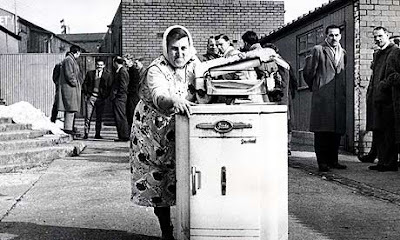 The club tried to persevere, returning to the Lancashire Combination, but closed their doors for good in 1966. In 1968, supporters founded a new club under the name Accrington Stanley, who have since risen through the pyramid to their current position in League Two. On 5 March 1892, England played and won two different matches by identical scores of 2-0. The occasion was that year's British Home Championship, contested among England, Scotland, Ireland, and Wales. The latter two opened the competition with a 1-1 draw a week earlier, then both had their second matches scheduled against England, but on the same day. And in two different locations. So the English sent two different teams. Wales hosted one team at the Racecourse Ground in Wrexham and fell to goals from Arthur Henfrey and Rupert Sandilands. Meanwhile, England's other team beat Ireland at the Solitude Ground in Belfast with a brace from Harry Daft (pictured). Daft and Henfrey were teammates at Corinthians, while Sandilands played his club ball for Old Westminsters. Afterward, England got a month-long break before their next match, a 4-1 win over Scotland on 2 April that secured their fifth BHC trophy. 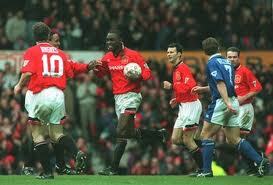 On 4 March 1995, Manchester United striker Andy Cole netted a record 5 times against Ipswich en route to a 9-0 win. It remains the largest margin of victory in Premier League history. United were the two-time defending champions, having won both titles since the Premier League's creation in 1992, and were challenging for a third. Ipswich, meanwhile, were in the relegation zone, just one spot off the table's bottom. But they had beaten United earlier in the season, claiming a 3-2 win at Portman Road back in September. Playing before a crowd of almost 44,000 at Old Trafford, United showed early on that they were not expecting a repeat of the previous match. In just the 16th minute, Roy Keane put them up 1-0 with a blast from outside the box, then Cole struck twice from close range (23', 37') to set the margin at 3-0 by the break. Things only got worse for Ipswich in the second half, as Cole scored twice more (53', 65') around a pair of goals from Mark Hughes (54', 59'). Paul Ince added an eighth in the 72nd minute, then Cole struck again in the 88th, making him the first player to score five teams in a Premier League match (though the overall top-flight record remains 7, scored by Arsenal's Ted Drake in 1935). The 9-0 result is also the Premier League's record margin (though the overall top-flight record is 12, set by West Brom in 1892 and matched by Nottingham Forest in 1909). Cole's tally has since been matched by Alan Shearer, Jermain Defoe, and Dimitar Berbatov, but has not been exceeded in a Premier League contest. Although the loss sent them down to 19th place, things did get better for the club as they finished the season in eleventh.